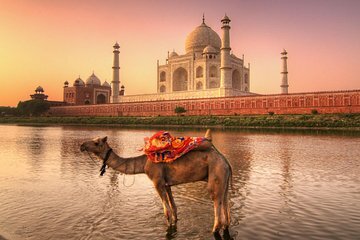 If you’re short on time while visiting India, but want to pack in a ton of popular highlights along the Golden Triangle, this private Agra and Jaipur tour is perfect for you. Along with an included breakfast and round-trip transport from the Delhi area, enjoy visits to Amber Fort, Lake Palace, Palace of the Winds, and the world-famous Taj Mahal. I and a colleague only had one day free to visit in Delhi area and wanted to see both Agra and Jaipur. This is a long trip it took us over 20 hours with traffic. The up side is you get to see the Golden Triangle in a day which is epic. Mr KK Sharma our driver was at the hotel nice and early waiting for us before pickup. He made sure we were comfortable and drove on the new highway between Delhi and Agra allowing us to sleep. In Agra we were at the Taj for sunrise and our tour guide Mahesh Kumar was very knowledgeable bringing the history and story of ages past as well as detailed knowledge of the building materials from around the world. He advised us on a photographer inside Taj area who did a great job ensuring our photographic memories where better than we could do -- I love the photo with the Taj reflecting in my sun glasses - well done.This was the main event in Agra, we visited the outside of the fort, but had to move on to breakfast to keep to schedule. Breakfast was excellent, it was a high grade western hotel serving both Eastern and Western food. On to Jaipur, a long journey, Mr KK our driver was helpful and willing to stop for comfort breaks. On the crazy Indian roads Mr KK kept us safe and on schedule. The first thing we did was lunch in Jaipur, a nice Indian restaurant with clean toilets and reasonably priced but tasty food. Unfortunately it rained so it was not sensible to photograph the Palace of the Winds when we were passing, so Mr KK sent us some photos from a previous tour so we had memories, and later in the day when the rain ended we revisited the site for more photos. Our Jaipur guide was Ashok Sharma, a young energetic but very knowledgeable man who took us to the Palace in Jaipur. It rained as we arrived but Mr KK came to the rescue with umbrellas for us and the guide - great thought and preparation, he also provided water during the trip. The palace was very interesting showing fantastic wall painting, fabrics and military equipment. Mr Ashok explained the position of Jaipur in the area and links with the UK during British occupation and afterwards. Amazingly the paint in the main court room contains gem dust so it shines amazingly - unbelievable but there is an area which you can touch and feel the stone particles. After the rains we visited a carpet and fabric hand-printing shop / collective which is famous for supporting poor communities. Hilary Clinton visited it a few months ago to see how it was transforming communities, it was not on the agenda but we agreed to go as it was an interesting project. after this we returned to Palace of the Winds, Took Photo's of the Palace on the Lake and went into the hills to see the Amber fort. It was then time to travel home which Mr KK handled while we rested. A long day, which gave us a taste of the wonders of Agra and Jaipur. There is so much more to see, but if you only have a day and want to go to both places then this is the only option. I had regional meeting in Gurgaon-New Delhi for 7 days and I had 1 free day to getting around. I decided to book this tour since I would love to see both cities, Agra and Jaipur. As this was my business visit, my company didn't allowed to me take such a long trip for a solo woman traveler because of security concern. So I decided to take Agra tour only. Mr. Prem, my driver was very attentive during the trip and he spoke English fluently. He provided mini wifi router, so I can even make social media live streaming during the trip. In Agra, I met my private tour leader, Mr Mahesh. He inform me earlier what to expect during the tour and how to manage all the situation. Mr. Mahesh was fully insightful about history of Taj Mahal, Agra Fort and current industry in Agra. 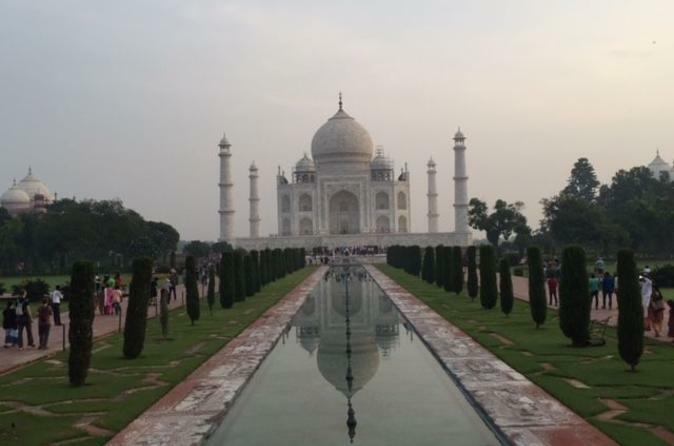 He took me into several places that enable me to see Taj Mahal on some different angle. He ensure my safety and I'm happy during the trip. This trip was definitely a-mind blowing experience for me and the service from Pacific Classic Tour India was excellent.